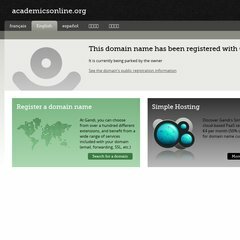 Academicsonline is ranked > 3,000,000 in the United States. It has 2 DNS records, ns2.onlinenic.net, and ns3.onlinenic.net. The programming language environment is PHP/5.3.8. PING www. (208.91.197.133) 56(84) bytes of data. Pinging the server, resulted in a 38.5 ms response.